There has been a lot of talk about bringing the deficit down. Clinton argued that issue in support of his massive $245 billion tax increase. While it is true that the deficit declined over the last two years, it is NOT true that this was due to massive cuts in spending or the rise in taxation. The evidence clearly shows that the primary reason why the deficit declined was simply the non-political market forces that drive world interest rates themselves. With nearly 70% of the national debt being funded in 10-year instruments or less, the sharp nose-dive in interest rates over the past two years has brought interest expenditures of the federal government significantly lower. This declining trend in world interest rates produced a net savings, as reflected in the declining deficit. It would be extremely dangerous for anyone to characterize the recent decline in the deficit as a political victory for either party or as proof of the benefits of a higher-taxation philosophy compared to another. Instead, the fact that short-term rates fell to half that of long-term, accounts for the recent decline in the deficit – not brilliant economic leadership on the part of Congress or the current Administration. The decline in interest rates basis the Federal Reserve Discount Rate is self-evident. From the recent high in the Discount Rate of 7%, established on February 24th, 1989, the decline in interest rates remained rather steady until the lowest level was finally reached at 3% on July 2nd, 1992. This drastic decline of more than 50% had a direct impact upon government expenditure as the average rate of interest declined from 8.5% in 1989 to 6.6% by 1993. For the fiscal years 1990-1993, the total minimum amount saved on interest expenditures for the federal government amounts to $168.2 billion had interest rates remained unchanged at the 8.5% level of 1989. The response by the Clinton administration to this declining trend in interest rates was the opposite of the policy government should have pursued. Long-term interest rates failed to decline in direct proportion to that of short-term rates and at the bottom in the interest rate cycle, long-term rates remained at an historical high of nearly double that of short-term. As a result of this disparity between long- and short-term rates, the Clinton administration attemped to manipulate the curve by forcing long-term rates lower through reducing the supply of 30-year bonds and increasing the funding of the debt with instruments of 5 years or less in maturity. The number of treasury auctions for 30-year bonds were cut in half in an attempt to create a false demand among long-term investors. The net result of this manipulation has placed the national debt of the United States in an extremely precarious position where the interest expenditures of the government can now be hel d hostage to the short-term changes in confidence that acts as the driving mechanism behind interest rates as a whole. We must realize that capital responds in the free global market on a level of confidence. If confidence is lost within the fiscal responsibility of any administration, capital will flee. This became self-evident in Sweden, Italy and most recently in Mexico. We must also realize that the power to tax is a power that does not translate into government dictatorship. History has demonstrated countless times that as taxation rises, capital flight begins. Capital is also impacted within a domestic economy by the net level of return and taxation is a major component of capital investment. This is best illustrated by the change in tax policy that has effected interest rates within the United States. Figure #1 clearly demonstrates that a massive decline in long bond prices took place once government began to fully tax the interest derived from government bonds. Prior to World War II, government bonds were ALWAYS tax free (with the exception of partial taxation during World War I). The tax free status of government debt was the primary incentive to buy government bonds in the first place. The low in bonds in 1981 took place in combination with the peak in inflation and the tax-cuts under Reagan! When tax rates were again raised under the current administration, interest rates began to reverse trend once again and began to move higher. We simply cannot raise taxes and then expect capital to remain unaffected in its investment decisions. Confronted by an evil and corrupt government and the consequences of its unsound finance, the speculator may prosper from the wild fluctuations in price. The capitalist will protect himself by hoarding and refusing to invest while commerce, having no nationality, will leave in search of more fertile ground; but the wage earner, first to suffer under the ravages of a depreciated currency, remains incapable of prospering from the fluctuations in price and frustrated by his inability to hoard his own labour from the ever encroaching demands of taxation. His dilemma is without peaceful resolution for he can but only flee to another land or sacrifice his life in defiance of the injustices of the greedy ruling class. This ill-fated attempted manipulation by the current administration to lower long-term interest rates took place precisely when government should have been locking in its debt for the greatest possible maturity available. As a consequence, this manipulation will now result in a more rapid advance for interest rates on the short-end of the curve as we move into 1996. While there are those who have claimed credit for the deficit reduction without mentioning the interest expenditure savings, the rise in the deficit that will now take place as a result of rising interest rates will be blamed once again on any reduction in taxation. Such unethical characterization of the financial position of the nation for purely partisan self-interest runs the risk of dangerously masking the crisis in debt that the United States now faces as we move into the turn of the century. We MUST face the TRUTH about our budget and end this partisan characterization of every change in trend to the sole exclusive change in trend in taxation with total disregard of interest expenditures that now account for over 25% over dollar the government receives. To make matters worse, an analysis of the budget reveals that the savings obtained by government during the period of declining interest rates was simply passed on through greater social spending. Not one cent of the savings was actually applied by Congress t oward reducing the national debt. For example, the interest for 1991 stood at $285.3 billion on a $3,665.3 billion national debt. 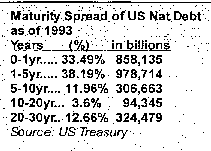 This suggests that the average rate of interest paid by the federal government was 7.78% during 1991. By 1993, the national debt grew to $4,351.2 billion with interest expenditures of $292.5 billion giving an effective average rate of interest of 6.72%. If interest rates had NOT declined between 1991 and 1993, then the 1993 interest expenditures would have been $338.5 billion at 7.78%. This resulted in a $46 billion savings that paid for the crime bill. We must realize that interest rates are not completely driven by the designs of the Federal Reserve. While it is widely recognized that long-term rates are established through the demand of the free markets, short-term rates are also subjected to those same market driven forces. With the shifting of the national debt into a far greater short-term funding cycle, the demand for capital has been shifted on the curve to 5 year or less maturity. Regardless of fed policy objectives, domestic policy objectives are still held hostage to those of international capital flows. With government demand for capital increasing on the short-end of the curve, rates at this end of the maturity curve will have a far greater tendency to rise more rapidly than those at the lower demand for long-term. This shifting of demand for capital on the part of government will result in a self-fulfilling inverted yield curve and an escalating cycle of rising interest expenditures in the immediate fiscal year. The 2.75% rise in short-term rates during 1994 will now add $23.5 billion in interest expenditures over the next year on just that portion of the national debt that is funded 1 year or less. We MUST now assume that short-term rates will continue higher, particularly throughout 1995, irrespective of Fed inflationary policy. Just as the Japanese real estate investors, who got into trouble through buying long-term investments with short-term funding, the yield curve will invert whenever too much demand rests on one side of the curve. In Japan, short-term rates DOUBLED within a single year as a result of the improper funding of long-term debt with short-term funding. We now run the risk of US short-term rates doubling from their recent historical lows by 1996 due to the same improper fiscal position of the United States. As a direct result, we could easily move into a crisis mode during 1995 and 1996. A doubling in the discount rate back to 6% (1% less than the 1989 high), will shift the average interest rate on the national debt well above the 8% level. This implies that by 1996, interest expenditures could rise substantially irrespective of Fed policy or Republican changes in spending. If we look at that portion of the national debt that is funded 1 year or LESS (33.4% of total debt), every 1% rise in short-term rates will result in a $14.3 billion i ncrease in interest expenditures on only that portion of the debt itself! Rates have already risen 2.75% during 1994. This warns that we could see the next fiscal budget result in a $43 billion increase or more in interest expenditures even if rates do not rise further from current levels. Clearly, we are in SERIOUS trouble! Figure #3 illustrates the rate of change in the discount rate compared to that in the federal interest payments. It is important to note that during the pre-1981 period, changes in the discount rate tended to be reflected in the interest expenditures on a 1 year lagging basis. This relationship tended to expand between 1977 and 1981 due to the sharp rise in the overall level of interest rates themselves. As time passed, the lagging period between the interest expenditures and the interest rate itself tended to shorten. As a result, changes within the discount rate have a much more immediate impact upon the total interest expenditures in today’s financial climate. We can also see in Figure #4 that the average interest rate on the national debt did not exceed 3% until 1960. By 1966, the interest rate had exceeded 4%. The 5% barrier was exceeded in 1969, 6% in 1973, 7% was exceeded in 1978, 8% in 1979, 9% in 1980, 11% in 1981 and finally 12% in 1982 . Our computer models have determined that given the present set of circumstances, a 25% increase in the average rate of interest on the total national debt could easily be the MINIMUM consequence by 1998 with a distinct possibility of reaching a new record high between 1998 and 2003. If we consider that short-term rates are capable of doubling from the 1993 low by 1996 and the amount of 2-year or less paper accounts for more than 45% of the national debt (Figure #2), then the shortfall in the deficit could be very shocking as it exceeds $60 billion at roll-over time in the 1995-1996 fiscal year. The seriousness of our Debt Crisis is well illustrated by the maturity viewpoint expressed in Figure #2. If we now look at the interest expenditures as a percent of total federal receipts (Figure #5), we can see that the 10% mark was finally exceeded in 1971 following the closing of the gold window and the abandonment of convertibility of the US dollar (gold standard). The Federal Reserve’s battle against inflation, which ran out of control under Jimmy Carter, caused more serious long-term damage than the short-term benefits of reducing inflation. The drastic rise in interest rates may have killed demand for capital in the private sector, but it did nothing to stop the spending demand within Congress. By 1981, interest as a percent of receipts soared reaching the 15.9% level. During the subsequent 8 years of Reagan, the budget was balanced between social and defense spending, but the interest expenditures reached $1 trillion. The lag between the current interest rate and its effect upon the interest expenditures was clearly present despite attempts by the D emocrats to rewrite history. As a percent of total receipts, interest expenditures reached the 27.14% level in 1991. The sharp decline in rates combined with the shifting of the national debt short-term under Clinton has resulted in interest expenditures as a percent of receipts falling back to 25.36% for 1993. Figure #6 provides a look at the US interest expenditures as a percent of total federal outlays. Here again, we can see that the steep advance in this percentage view began under Carter in 1978. The peak was reached at 21.6% during 1991 and only a modest decline back to 20.8% has taken place going into 1993. Anyway we slice it, we have a major crisis in debt on the horizon that could easily send the US into an inverted yield curve and disrupt the political forces at will. Politically, the sweeping changes that the people have made in 1994 may be too little – too late. The damage that the Clinton administration has already caused by shifting the funding more short-term has only yet begun to work its way into the marketplace. Clinton essentially reversed the trend of extending the maturity of the national debt which had been the basic policy since 1976 (Figure #4). Clinton’s use of interest expenditure savings to fund more social spending has failed to produce any significant economic advantages and may now result in a market-driven, forced shortening of maturity going into the end of this century. When we look at the yield-curve (Figure #7), the Clinton intervention becomes quite clear. Short-term rates basis 1yr bills actually reached their historic low at 2.746% during September 1992 going into the presidential elections. Following the Clinton victory, 1 year rates jumped to 3.343% by the end of November 1992. 1 year rates tended to gradually increase throughout 1993 closing that year at 3.598%. During this same period, 30 year bonds rates fell from the election high of 7.63% to 5.965% for the close of October 1993 and settled for the year at 6.348%. The Clinton manipulation resulted in bringing 1 year rates up by slightly more than a half-point while 30 year rates fell only about 1.65%. The only clear benefit was a reduction in current interest expenditures that was pumped into social spending. If we now look at how fast short-term rates have risen, we CANNOT solely blame the Fed. The shifting of the debt from long- to short-term funding has resulted in a sharply rising demand for short-term cash on the part of the US government. Clearly, the Fed may have some concerns about inflation, but at the same time they are being pushed toward higher rates due to the Clinton manipulation. As rates rise, this will cause federal interest expenditures to rise irrespective of which party holds the reigns of power. Our computer projection for a MINIMUM rise in 1 year rates shows a distinct potential to reach the 12% level as early as 1996, but no later than 1998. While some might think that this projection is insane, the y should keep in mind that the Orange Country default is merely the tip of the iceberg. Any additional problems that arise in US municipals combined with problems in Mexico and Canada could easily lead to wholesale skepticism in government debt worldwide. This type of atmosphere will only propel this trend into an exaggerated move toward higher rates. Again, there will be many who would argue that a panic in government debt markets would never happen. In fact, this is the precise thing that has ALWAYS happened whenever government debt has grown to an alarming level in history. While many economists would like you to believe that the Great Depression was all about greed and speculation, the truth of the matter is that it was about a massive worldwide default in government debt! All of Europe permantly defaulted on its debt with the exception of a 6 month moratorium in Britain. All of South and Central America permanently defaulted as well as most of Asia. The German bond default of 1931 involved $12 billion alone and it took the BIS (Bank of International Settlements) until 1937 to calculate the total debt that was permanently wiped out. This stands in stark contrast to the peak in broker loans on the NYSE in 1929 which had stood at only $6.5 billion. The truth about 1929 has been largely hidden by many economists who painted a scenario of greed to further their socialistic goals. Nevertheless, the blunt fact remains that the amount of money ever invested in the stock market in comparison to that of bonds is far less than 10%. In fact, leading into 1929 the ratio of bond to equity investment ran 16:1. Today, the total amount of capital invested in the world bond market is nearly 20:1 when compared to equities. As a result, a stock market crash may be capable of creating a recession, but only a collapse in the bond market is sufficient to wipe-out enough capital formation in order to create a major depression. The evidence is quite clear when it comes to HOW BOND MARKETS TRADE RELATIVE TO CONFIDENCE. During the Financial Crisis of 1931 as nation after nation abandoned the gold standard and defaulted on their debts, both the currency and bond markets were going crazy. Figure #8 illustrates an important point about bonds and interest rates. Here we can see that even though the Fed lowered the discount rate, the US treasury bonds still collapsed! Contemporary newspaper accounts reflected the view of that era as one of distrust. If nation after nation was defaulting and the US was the last nation still honoring its debts, it was assumed that a US default would also take place. Therefore, despite lower interest rates, government bonds still collapsed. In addition, the evidence is also quite clear that the Great Depression was at least in part caused by governments through their G4 attempted manipulation of the world capital flows in 1927. At that time it was widely suspected that there was a problem with government debt being issued in Europe. The yield spread between US and German bonds was nearly 7% at times. In an effort to help lower interest rates in Europe, the central banks banned together for the first time in history in an attempt to deflect capital flows from the United States back toward Europe (Figure #9). The individual powers of the Federal Reserve branches were usurped into a single national policy as reflected by a single discount rate. Previously, each Federal Reserve branch set its own discount rate as a means of solving regional capital flow problems within the nation which had been identified as the cause of the Panic of 1907. Once the powers were concentrated into a single Federal Reserve, the discount rate was lowered in 1927 in hopes that capital would be deflected toward Euope for the higher yield. Instead, the suspected debt problems within Europe, which had been previously only rumor, were taken to be real. Capital began to leave Europe and moved, for the most part, directly into US equities. As a consequence, the US stock market DOUBLED between 1927 and 1929 – despite the fact that the Fed doubled the interest rates in an attempt to stop what they had misread as a purely domestic speculative bubble (Figure #10). As bond markets fell and stocks rose between 1927 and 19(*9, the yield curve in the United States also inverted as a consequence of the Fed’s actions combined with a growing lack of confidence within public sector debt overseas. The decline in confidence within government debt also sparked a massive shift in investment capital from bonds into the stock market (Figure #11). This trend is unfolding again today in a gradual manner as it once began in 1927. As concern over the quality of government debt builds in today’s environment, capital will shift toward private sector investment. This trend will be especially self-evident between 1994 and 1996. In our historical research of net capital movement on an international, regional and public vs. private sector flow basis, it is abundantly clear that capital begins to gradually move away from the investment area that comes into question. The initial stages of this capital movement is ALWAYS gradual and at first confusing to the contemporary analysis of the day. Nevertheless, as capital begins to shift, shortages build in the sector of concern. As a result, the financial crisis that follows NEVER appears in the blink of an eye as many would tend to think. When the concern becomes visable to the majority – panic strikes. The Crash of 1987 was caused by an attempted manipulation on the part of the central banks through their G5 activities. The intended purpose of the manipulation was to lower the value of the dollar by 40% which was believed would result in a reduction of the US trade deficit by making US goods cheaper overseas. They FAILED to realize that by lowering the value of the dollar, not only do exports decline in value in the eyes of foreigners but also all assets within the nation experiencing a depreciating currency. As a result, the net losses to Japanese investors in US bonds has drastically altered the investment horizon in Japan and worldwide. The Japanese use to buy up to 40% of all US Treasury bond auctions prior to 1987 and in the post-87 era they account for less than 3%. There MUST be a concerted effort made at this point in time to shift the national debt back into a long-term funding mode. The marketplace is already sensing disaster on the horizon as evidenced by the gap narrowing between AAA corporate paper and that of treasuries. Any attempt to inc rease the size of 30 year bond auctions will be met by a drastic collapse in bond prices with its corresponding rise in yield. Capital has been sensing a problem with government debt for some time now. First it began to move from long-term into short-term following the Crash of ’87 (See Figure #12). This is why short-term rates fell in an exaggerated manner while long-term bond rates declined only marginally. The second shift is evidenent by the fact that the bond market fell by more than 30% while the Dow Jones Industrials continued to move sideways despite higher interest rates. The pattern of capital flight is again the same today as it has been in every historical situation where government debt comes into question. If government FAILS to recognize these warning signs and continues to ASSUME that ALL THINGS REMAIN EQUAL, a serious financial crisis will appear on the horizon as early as 1996, but most certainly between 1998 and 2003. The swing in the political will of the people last November 8th is indicative of the concerns that are building. Not only can we not afford politics as usual, we can also no longer afford the management of our national finances as usual. Since the capital concentration within the United States, which took place as a result of World War I and II, both the marketplace and American politicians have been mistaken to assume that government debt is automatically regarded as secure and at the top of the shopping list of demand. The evidence is quite clear that the preference between various government sectors and that of the private sector debt issues is not written in stone. There have been varying cyclical trends that swing back and forth depending upon the confidence within the demand side of the equation. The Orange County default is but one example of how changes int the perspective of risk is now entering the equation. Unless a serious reversal in government spending takes place, the assumption that demand will never change is an unrealistic assumption. Government cannot simply continue to borrow with impunity. At some point along the way, all things will NOT remain equal and demand will drift away from government securities and move toward AAA private sector issues and equities. Therefore, this trend, wich is self-evident at this time, is NOT a temporary fluke, but a reversal of the postwar trend that has existed only since the capital concentration within the US since World War II. Can Government Prevent The Financial Debt Crisis? The government MUST issue TAX FREE bonds with maturities of 10, 20 and 30 years. They should be issued on a ZERO-COUPON basis thereby deferring all interest to maturity. As an incentive to hold these issues to maturity, the interest itself should be TAX FREE. The denominations should be small, perhaps starting at the $1,000 level. All immediate savings in interest expenditures should be applied to retiring debt in the current fiscal year. This will help reduce interest rates and also help bring our debt that is currently held offshore back onshore. Most foreign citizens do NOT pay taxes on US interest earned on our government debt. While the Democrats will argue that this will benefit the rich, the Republicans should respond by stating that they are providing Americans with the same benefits as foreign citizens. A Tax-Amnesty should be called with a 1 year window. Anyone who has cash income that they have NOT declared should be allowed to do so without penality or interest. Better yet, make the rate only 15% (current income not qualified). With the underground economy believed to be in excess of 20%, this could produce a huge windfall in revenue. All revenue collected by this program should be applied to retiring debt. When the Democrats argue that this will benefit the criminal rich, a simple point should be made that this is revenue that the IRS is unaware of and would have no ability to collect. An immediate FREEZE on all government hiring should be put in place. By 1996, a MINIMUM 10% reduction in government personnel should be implemented with a legal limit being impose d at 25% of the civil work force by 2000. In addition, any cost of living increases on government pensions should be eliminated on persons collecting more than one pension from the government. Ideally, CPI increases on government pensions should be completely eliminated. If interest rates continue to rise at the current growth rate, the point at which revenue will be unable to meet entitlement payments will arrive BEFORE the year 2000 – instead of 2030 as current government reports suggest. Such government reports are also assuming that the CPI remains virtually unchanged at current levels in addition to interest rates remaining unchanged at 1993 levels. A massive government consolidation effort MUST be undertaken. We simply cannot afford one-third of the civil work force employed among the ranks of the public sector. Government employees produce nothing whatsoever and instead act as a drain upon the nation income and the productive forces of a modern society. This suggests that we simply must reduce not merely regulation, but also the size and cost of government as a percent of the total gross domestic production. We must launch a major effort to reduce government by enacting a ONE AGENCY – ONE REGULATING AUTHORITY policy. For example, in the financial sector there are two agencies that regulate the investment industry – the CFTC and SEC. These two agencies should be merged into one thereby eliminating two administrative staffs, accounting and management not to mention field agents. A consolidation of these two agencies, which constantly battle each other for authority, would save at least 25% of the current combined cost. There are countless overlapping examples between the Department of Agriculture and National Parks, Wildlife and the EPA, etc. The list is simply endless. A massive consolidation that follows the premise of ONE AGENCY FOR ONE PROGRAM will reduce the cost of government by at least 10-15% with the possibility of reaching savings as great as 20%-25%. In addition to legal reform, a major effort should be considered where a sharp reduction in the number of court cases and over regulation can be handled. The one NEW government body that does need to be created is a separate panel of judges that will determine the constitutionality of any new regulation or interpretation on the part of an agency before that regulation or interpretation is enacted. Currently, a private citizen cannot challenge a new law until that law inflicts harm on an individual. Once a harm has been inflicted, it becomes that individual’s right to appeal to the Supreme Court – provided he has the legal resources to do so. If the individual does NOT have the financial resources to challenge a new law or interpretation, the government wins by default. This is simply immoral within a free society. Therefore, a new body must be established where all agencies are compelled to seek the approval of that panel BEFORE inflicting harm on the population at large. This will reduce the number of cases that are causing a backlog in the courts and thereby reduce the mounting pressure to establish more courts at the expense of the taxpayer. This new agency would have final authority over ALL agencies and perhaps should be part of the Supreme Court. Any new REGULATION or INTERPRETATION that goes into effect would therefore already be clarified as to its Constitutionality. To eliminate the pork-barrel politics that has propelled the budget crisis, NO bill in the House or Senate should be amended with any proposed spending or state mandate that is not directly related to the nature of the bill in question. In other words, no grants to favorite universities and no midnight basketball funding labeled as fighting crime! Any crazy study to watch the flow rate of Ketchup would have to be proposed as a stand-alone bill and the author would have to face the consequences for doing so. If these measures can be truly implemented, then there will be a hope of preventing this debt crisis from destroying society. If we FAIL in these measures, keep in mind that the collapse of Russia did not come about because of idealogy. Russia collapsed because of poor economic management and fiscal irresponsibility. This will be the fate of the United States. We can already see the regional tension building over social differences and illegal immagration. When economics plays into the equation, those regional differences become magnified until they emerge as the battle cry for change and, at times, even separatismand ultimately revolution.